Supercars are famous for being a lot like exotic snakes – if you’ve got enough cash you can own one, but you do so at your own risk. In either case, if you lose control for just a split second, you are going to get bit; though unfortunately no anti-venom in the world can quell the humiliation and financial ruin of a totaled supercar. Or at least that’s how it used to be, until the advent of the Audi R8. Named after Audi’s five-time Le Mans winning prototype, the R8 may go down as the world’s first truly forgiving supercar. 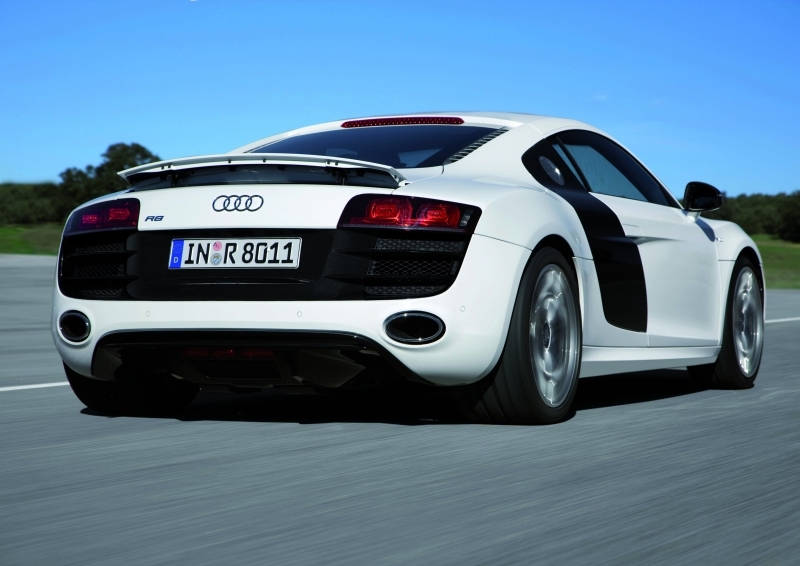 Its mid-engine balance and Quattro all-wheel drive make the relentlessly fast and immensely capable R8 astonishingly easy to drive at speed. And now they've gone and wedged a V-10 in it. Don't get us wrong, the standard V-8 R8 was no slouch, but it hung out more in the Porsche 911 circle than it did with the supercar crowd. But now that it boasts 525 horsepower and a robustly exotic V-10 soundtrack, it has true supercar credentials. Inside, drivers enjoy typically stellar Audi build quality, not to mention the sound of that mid-mounted engine cranking away. Certainly people will find a way to wreck even this most tolerant of land rockets, but with such impeccable balance, grip and agility, they’re going to have to kick this snake pretty hard before it bites back. This car doesn’t go unnoticed – it’s pretty much like driving around in the Millennium Falcon, though a Chewbacca-esque presence is purely contingent on who you choose as your passenger. Rampant acceleration, insane grip and controlled poise are coupled with a comfortable cabin to create a truly usable performance machine. Plus, have you ever been from 0-60 in under 4 seconds? Driving the R8 is about as blissful as it gets. Audi’s high-revving 5.2-liter V-10 – quite similar to the engine found in the Lamborghini Gallardo – provides astonishing thrust, especially once it hits its stride above 5,000 rpm. Like a good pair of running shoes, the R8’s helm keeps you well informed of what’s happening on the asphalt. The impeccable balance provided by the engine’s placement amidships allows the R8 to change direction with remarkable speed and composure. Quattro all-wheel drive provides prodigious grip, constantly taunting you to try and push the car beyond its limits. Rest assured that if you do – and it takes a lot of effort to do so – the Quattro system will gather things up quickly and without incident. With an 8,700 rpm redline, Audi's 5.2-liter V-10 likes to be revved into the stratosphere, producing 525 horsepower at 8,000 rpm and 391 lb-ft of torque at a lofty 6,500 rpm. Power is driven to all-four wheels, with torque biased rearward at a split of 15/85 and both a six-speed manual gearbox and six-speed automatic sequential are available. Being a flagship model, the R8 comes light on options. Those looking for an automatic gearbox may be somewhat shocked to find out the R tronic sequential will set them back $9,100, though we do have to say the paddle-activated, rev-matched downshifts rank pretty high on the awesomeness-to-price scale. Other options include a premium package, various leather upholstery packages, navigation, alcantara headliner and alternate ‘sideblade’ colors. As you’d probably have guessed looking at it, the R8 isn’t a vehicle that skimps on technological flair. Audi’s magnetic ride suspension works much like Ferrari’s Manettino system and has the ability to stiffen the suspension at the push of a button by altering the stiffness of the shocks via magnetic charge. The system varies the damping of the suspension through turns, working to eliminate body roll and dive under braking. Fullly LED headlamps with Audi's now iconic surrounds show off the R8’s futuristic predisposition outside, as does the LED-lit engine compartment. With its 8,700 rpm V-10 powerplant, the R8 5.2 FSI is pretty much the genetic opposite of a Toyota Prius. Its fuel economy returns certainly fit the supercar bill, with the manual R8 achieving 12 mpg city and 20 mpg highway, and the automatic coming in at a slightly better 13 mpg city and 20 mpg highway. Strangely enough, that's right in line with the V-8 model. With a base MSRP of $146,000, the R8 keeps itself in good company, going directly up against some of the best in the business, such as the Porsche 911 Turbo, Maserati GranTurismo and Aston Martin V8 Vantage, Ferrari F430 and, of course, the Lamborghini Gallardo LP 560-4. While the mid-engine R8 is quite different from the Aston and Maser, we won’t be surprised if the Audi’s style and superb drive manage to steal away some potential buyers. 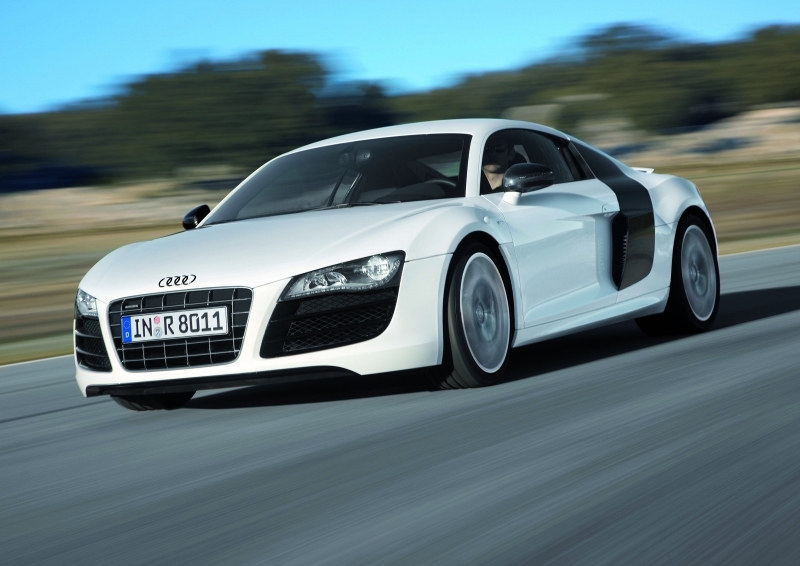 The Audi R8 has certainly raised the bar for carmakers the world over. Its driving precision dissects the road with the aptitude of a scalpel in the hands of a skilled surgeon, making the driving dynamics of lesser sportscars feel like trying to perform an operation with a filet knife. The fact that Audi has managed to create such a usable, forgiving mid-engine supercar on its first try is immensely impressive. 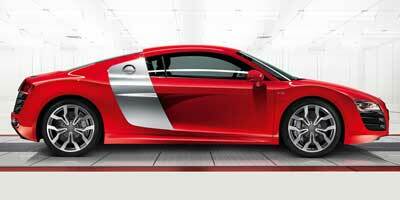 Like its Le Mans predecessor, the Audi R8 is, without a doubt, a legend in the making.